“We've got our feet on the ground with Osborne Bulls but we are confident the horse is at his best to run a big race,’’ Cummings said. “After we ran in the Rupert Clarke we agreed to run him in the best race we could but you'd have been a brave man to suggest he'd have got his way into The Everest. Sheikh Mohammed's five-year-old gelding, by Winx’s sire Street Cry, didn’t start his racing career until the last week of July last year where he won on debut at Newcastle. “He was going into that race off a setback and it was a high pressure Group 1 so I'd be forgiving him that one,’’ he said. 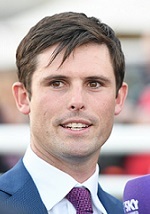 “He's a weapon and has shown a devastating turn of foot in the past but he's up against some extremely fast and strong WFA 1200m sprinters,’’ Cummings said.